NATURE AND MORE Come enjoy “Humanity and Nature” art at the annual Solana Beach Library Art Show through Nov. 1 at 157 Stevens Ave. by the Sargent Art Group. For more information, call (858) 755-1404. AUDITIONS The Village Church Community Theater announces auditions for “Rented Christmas” a musical from 6 to 8 p.m. Oct. 6 and Oct. 7 at the Village Community Church, 6225 Paseo Delicias in Rancho Santa Fe. Roles for a large cast include children 8 to 12, teens and adults. Performances are Dec. 5 through Dec. 7. For audition information and appointment contact margiew@villagechurch.org or villagechurchcommunitytheater.org. ARTIST FEATURED The COAL Gallery hosts a fine art show, featuring artist Mary Ann Nilsson, Oct. 8 through Nov. 2 at 300 Carlsbad Village Drive, Suite 101, Carlsbad. Hours are 11 a.m. to 5 p.m. Monday, Wednesday, Thursday, and Sunday; Friday and Saturday 11 a.m. to 8 p.m. For more information, call (760) 434-8497 or visit coalartgallery.com. CLASSIC CHRISTIE The San Dieguito Academy Drama Production class presents Agatha Christie’s “The Mousetrap” at 7 p.m. Oct. 9, Oct 10 and Oct. 11 at the Clayton E. Liggett Theater on the San Dieguito Academy Campus, 800 Santa Fe Drive, Encinitas. Tickets are $8 for students and $15 for adults online at seatyourself.biz/sandieguito. LOCAL TALENT Guitarist Daniel Isle Sky will perform from 7 to 9 p.m. Oct. 9 at Wine Steals, 1953 San Elijo, Cardiff. For information, call (760) 230-2657 or visit danielislesky.com. ART LEAGUE The Carlsbad–Oceanside Art League hosts an artist demo with pastel artist Leslie Sweetland from 1:30 to 3:30 p.m. Oct. 10 at the Buena Vista Audubon Society, 2202 S. Coast Highway. A WAY WITH WORDS Famous wordsmith Richard Lederer will present a morning of linguistics fun from 11 a.m. to noon Oct. 11 at Carlsbad’s Georgina Cole Library, 1250 Carlsbad Village Drive, Carlsbad. Books will be available for sale and signing. 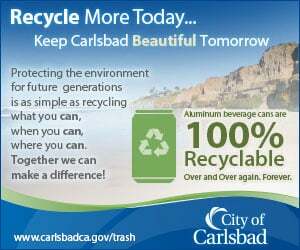 For more information, call (760) 602-2024 or email keith.gemmell@carlsbadca.gov. LUX AUCTION Join the Lux After Dark auction at 6 p.m. Oct. 11 at Rancho Valencia Resort, 5921 Valencia Circle, Rancho Santa Fe. The live auction has something for everyone this year. For tickets to the art auction, contact Colleen Ennis at cennis@luxartinstitute.org or call (760) 436-6611. DESIGN TOUR The American Society of Interior Designer’s Kitchen & Bath Tour, from 9 a.m. to 5 p.m. Oct. 25, showcases eight kitchens and three baths. The tour homes are in Escondido, Encinitas, Solana Beach, San Diego and Lakeside. Tickets, $25, are available at ASIDSanDiego.org and at all tour sites the day of the tour. For more information at (858) 274-3345.